Lumina Gold Announces Second Minera | Lumina Gold Corp.
Vancouver, British Columbia - Lumina Gold Corp. (TSXV: LUM) (OTCQX: LMGDF) (the "Company" or "Lumina") is pleased to announce additional drill results from the Cangrejos resource infill, step-out and depth extension program as well as the initial drilling of the Gran Bestia exploration target to the northwest. These eight holes (C18-93 to 100) represent the most recent results from the 2018 drilling, which has totaled approximately 12,800 metres over 32 holes. 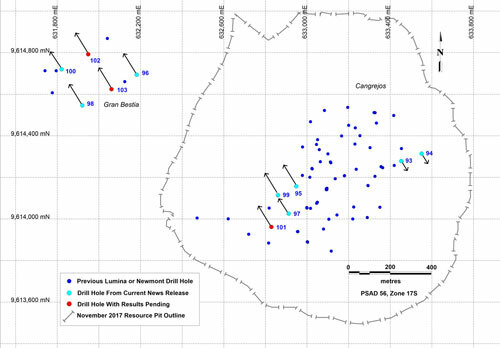 The results include three holes from Gran Bestia, which in addition to the five holes previously drilled by Newmont Mining confirm the existence of a satellite deposit not included in the current NI 43-101 resource estimate at Cangrejos. The Company also completed seven holes and approximately 2,300 metres of geotechnical and metallurgical drilling. "The addition of Gran Bestia to Cangrejos is significant and could substantially increase the scale of the current inferred mineral resource estimate of 8.5 million ounces of gold(1). The deposit has the potential to add to the 16 year mine life, increase the 373 koz of annual gold production or improve both. Additional drilling through the first half of 2019 will further enhance our understanding of the satellite deposit," said Marshall Koval, President, CEO and Director. (1)The inferred mineral resource estimate has an average grade of 0.65 grams per tonne of gold. Details of the current inferred mineral resource estimate at the Cangrejos Project are set out in the current technical report for the Cangrejos Project, titled "Cangrejos Gold-Copper Project Ecuador NI 43-101 Technical Report Preliminary Economic Assessment", with an effective date of June 27, 2018, as filed on the Company's SEDAR profile. Two drill rigs are currently working at the Cangrejos Project, with two more expected to arrive at site in February. In 2019, Lumina plans to drill approximately 7,000 metres in 23 holes for resource in-fill and exploration at the Cangrejos Deposit and approximately 5,200 metres in 13 holes at the Gran Bestia Deposit. Lumina intends to release an updated resource estimate in the second half of 2019 that will incorporate all of the 2018 and 2019 drilling. The resource estimate update will feature a maiden resource at the Gran Bestia Deposit as well as an updated resource for the Cangrejos Deposit, which will incorporate both expansion and infill drilling. In addition, a significant drilling program to provide metallurgical test materials and oriented core for engineering studies is also planned for the first half of 2019. One drill rig will be dedicated to large-diameter ("PQ") core drilling. Geotechnical drilling over eight holes for pit slope design is planned and select geotechnical holes will also serve as locations for pump tests and installation of monitoring wells to support hydrogeological studies. Approximately 1,800 kilograms of material from 2018 drilling has now arrived in Lima for metallurgical testing at the C.H. Plenge & CIA S.A. lab ("C.H. Plenge"). The metallurgical testing program is scheduled to be completed by Q3 2019. Lumina plans on shipping 2,000 kilograms of whole PQ core to FLSmidth Labs in Utah for the high pressure grinding role tests and a representative subsample of 200 kilograms to C.H. Plenge for continued metallurgical work. Holes C18-95, 97 and 99, drilled in the southwest of the deposit all cut zones of significant mineralization. Hole C18-97 is one of the best holes drilled to date at the Cangrejos Project, with mineralization over almost its entire 556-metre length. Holes C18-93 and 94 were step-out holes drilled on the southeastern flank of the main resource and intersected several intervals of mineralization. Holes C18-96, 98 and 100 were the first three holes drilled at Gran Bestia since Newmont Mining drilled five holes in 1999. Holes C18-96 and 98, were drilled first due to logistical reasons and were located near the southeast margins of the large rock and soil geochemical anomaly which delineates Gran Bestia. Both holes returned long intervals of significant grade mineralization. C18-100 is located more central to the anomaly and cut a long intersection from surface. Note: Intervals in the reported holes are calculated using a cut-off of 0.2 g/t Au with maximum internal dilution of ten continuous metres. The highest gold value used in the reported weighted averages is 14.95 g/t Au. Above cut-off intervals of less than 10 m are not reported. In addition to the above results there were multiple intercepts of lower-grade material in the drill holes. Certain statements and information herein, including all statements that are not historical facts, contain forward-looking statements and forward-looking information within the meaning of applicable securities laws. Such forward-looking statements or information include but are not limited to statements or information with respect to 2019 drilling plans, two additional drilling rigs expected to arrive at site in February, that Gran Bestia will add to the existing resource, mine life or annual production rate at the Cangrejos Project, that the Company will release an updated resource estimate in the second half of 2019, that the metallurgical testing program will be completed by Q3 2019, that Lumina plans on shipping 2,000 kilograms of whole PQ core to FLSmidth Labs in Utah for the high pressure grinding role tests and a representative subsample of 200 kilograms to C.H. 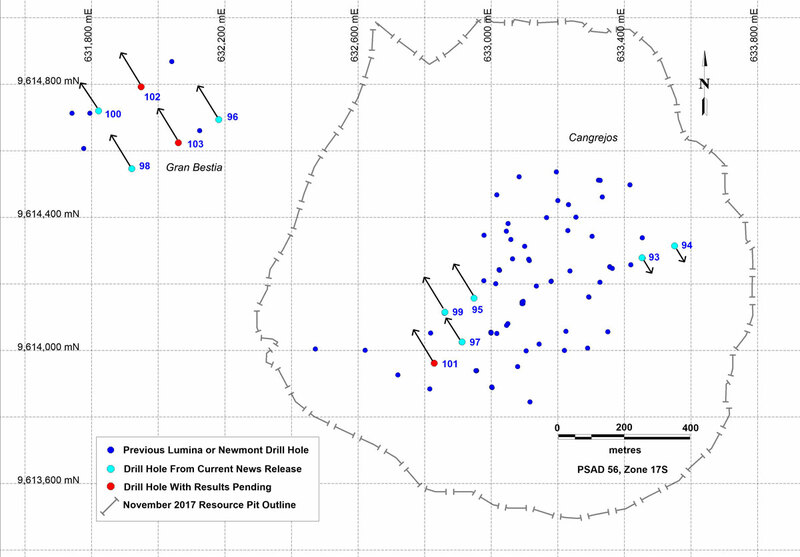 Plenge for continued metallurgical work, and that the updated resource estimate will feature a maiden resource at the Gran Bestia Deposit as well as an updated resource for the Cangrejos Deposit, which will incorporate both expansion and infill drilling. Often, but not always, forward-looking statements or information can be identified by the use of words such as "will", "plans", "may", "intends" or variations of those words and phrases or statements that certain actions, events or results "will", or are "expected to" be taken, occur or be achieved.